By the time Ptolemy II Philadelphus (ruled 284-246 BC) came to the throne of Egypt, Egypt had long ceased being an important power in the Mediterranean Basin or the Near East. The last great Egyptian dynasty was the Twenty-Sixth (664-525 BC), after which a series of weak native dynasties came to the throne interspersed with two periods of Achaemenid Persian rule. So when Alexander the Great conquered Egypt in 332 BC, it may have seemed like just another group of foreigners was going to rule Egypt from afar, making sure to deplete as many of her resources in the process. 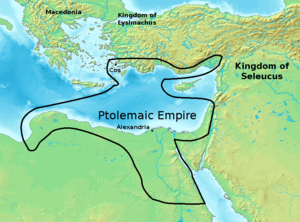 But the reality is that early Ptolemaic rulers – who were Macedonian Greek rulers named for the first king of their dynasty, Ptolemy I (reigned 305-282 BC) – especially Ptolemy II, helped revitalize Egypt culturally and made it essential militarily and economically once more in the region. Ptolemy II accomplished this feat by completing some ambitious building projects initiated by his father, introducing elements of Greek culture to Egypt while respecting native Egyptian traditions, and by revitalizing Egypt’s military. Long before the Macedonian Greeks ruled Egypt, other Greeks had long histories of interactions with Egypt and the Egyptians going back to the Middle Bronze Age. The earliest recorded interactions between the Egyptians and people from Greece and the Greek Isles are found in tombs and texts from Egypt’s Middle Kingdom (1974-1640 BC). The contact was probably limited for the most and primarily traded with the Minoans of Crete and then later in the New Kingdom (1550-1075 BC) with the Myceneans of the Cyclades Islands and mainland Greece. By the seventh century BC, the Greeks had begun expanding their influence in the Mediterranean Basin by colonizing coastal areas outside of Greece and by offering their services as mercenaries to non-Greeks, which is how they established a permanent foothold in Egypt. The first king of Egypt’s Twenty-Sixth Dynasty, Psamtek I (ruled 664-610 BC), invited Greek mercenaries and merchants to Egypt and allowed them to establish the colony of Naukratis and a Greek section of Memphis. Later Greeks, especially from Athens, became involved with Egyptian efforts to revolt against Achaemenid Persian rule. So by the time Alexander and his army of Macedonians entered Egypt, the Egyptians were familiar with Greeks, and the Greeks were familiar with Egyptians. When Alexander and his army drove the Persians from Egypt, they were welcomed as liberators for the most part. 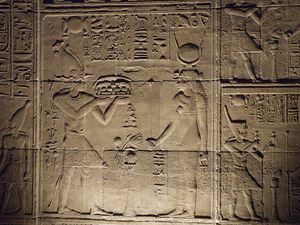 He visited the oracle of Amun in the Siwa Oasis, was proclaimed the legitimate pharaoh, and was coronated in Memphis, the traditional political capital of ancient Egypt. Although Alexander left Egypt and never returned, he mainly laid the foundations for a new Macedonian Greek dynasty to rule the Nile Valley. After Alexander the Great died, his top generals divided his kingdom up among themselves. Ptolemy Lagos, later known as Ptolemy I Soter of Egypt, received the prize of Egypt, although he had to defeat the general Perdiccas for that reward. Ptolemy I wasted little time rebuilding Egypt in his image. Some of the more impressive aspects of Ptolemy I’s reign are detailed on the Egyptian language Satrap Stela, foremost of which was his construction of the new capital, Alexandria. Alexandria may have been Ptolemy I’s vision, but it was the responsibility of his son and successor, Ptolemy II, to make that vision a reality. Almost as magnificent as the Lighthouse and arguably more important culturally speaking was the Library of Alexandria, which again is believed to have been the idea of Ptolemy I but finally completed by Ptolemy II. 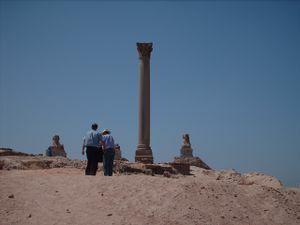 Ancient sources also credit Ptolemy II with building projects that were not as glamorous or well-known, but just as important to ancient Egypt’s prosperity. The later Ptolemaic kings became embroiled in a series of never-ending wars with their cousins of the Seleucid Empire in the east, but Ptolemy II instead turned his eyes to the south just as many Egyptian kings had done before him. According to Diodorus, Ptolemy II led a major campaign south into Nubia, which the Greeks knew as “Ethiopia,” becoming the first Greek to go that far south. “For from earliest times until Ptolemy who was called Philadelphius, not only did no Greeks ever cross over into Ethiopia, but none ascended even as far as the boundaries of Egypt – to such an extent were all these regions inhospitable to foreigners and altogether dangerous; but after this king had made an expedition into Ethiopia with an army of Greeks, being the first to do so, the facts about that country from that time forth have been more accurately learned." Whether or not Ptolemy II was consciously channeling the earlier pharaohs when he invaded Nubia is unknown, but he did make conscious efforts to recognize ancient Egyptian culture while he added elements of Greek/Hellenistic culture to Egypt. Ptolemy II allowed the native Egyptian cults to continue and even promoted them to some extent, at least as far as it benefited him and his family. Ptolemy II and his successor did, though, curtail the power of the native priesthood by taking control of the temple revenues. When it came to the sometimes contentious coexistence of ancient Egyptian and Hellenistic culture, Ptolemy attempted to walk a middle ground. Besides promoting some of the native cults, Ptolemy II also patronized native Egyptian scholars who were well-versed in the backgrounds of both cultures. Ptolemy II was also the major patron of Manetho, a high-priest of Re from the Delta city of Sebennytos, who lived during the reigns of the first three Ptolemies. Manetho is best known for his Greek language chronological history of the kings of Egypt, Aegyptiaca, which only survives today in fragments recorded by historians in late antiquity. Manetho is believed to have been one of the original priests of the Serapis cult, which was a Greek version of the Egyptian Apis cult. Ptolemy II envisioned that that cult would bring together the elite of Egyptian society with the Greeks of Alexandria in what can only be described as a truly Hellenistic venture. Ptolemy II also brought other Hellenistic ideas to Egypt during his rule. Ancient Egypt was a civilization that had many cultural peaks and valleys. When Alexander the Great conquered Egypt in 332 BC the land of the pharaohs was in one of its deepest valleys since the formation of the Egyptian state around 3100 BC. 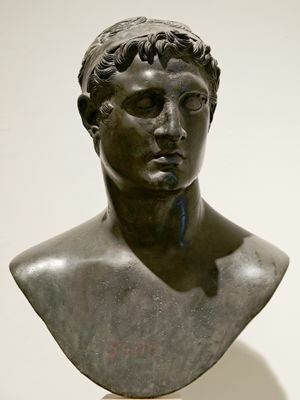 After the Macedonian Greek Ptolemy Dynasty was established, Ptolemy II revitalized Egypt by completing his father’s ambitious building program, embarking on foreign conquest, introducing new economic ideas, and by pursuing a cultural program that respected the native Egyptian traditions while introducing aspects of Hellenism. Because of Ptolemy II’s efforts, Egypt once more became one of the most important kings in the region and would be so for another 200 years. This page was last edited on 17 April 2019, at 08:53.